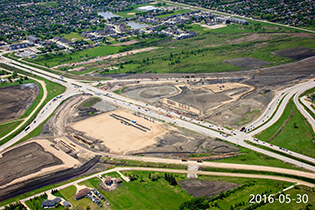 WE ARE A COMPANY COMMITTED TO "BUILDING THE FUTURE"
Nelson River Construction was formed in Winnipeg and operated its business between Montreal, Toronto and Winnipeg in the early years. In the 1950’s the company moved to its current location at 101 Dawson Road, in Winnipeg Manitoba where it repurposed the site of an old homestead, with multiple buildings, to become our Main Office, Repair and Maintenance Facility and storage yard for our growing fleet of equipment. Incorporated in 1923 to build sewer and water facilities, Nelson River soon expanded into concrete and asphalt paving. As our reputation grew, so did our company. Now in our 4th generation of ownership, we are approaching our 100th year in business. Our longevity and success is due principally to the incredibly talented people who have worked in the Nelson River organization over this timeframe. Approaching nearly 100 years in business and delivering on thousands of heavy construction projects, we have seen and done-it all. 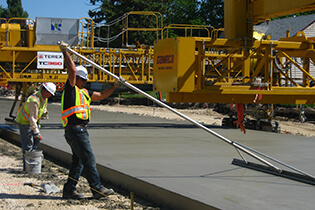 Our highly experienced workforce consistently delivers projects to the unique standards our Clients expect. Quality entails understanding and providing the core competencies necessary to deliver a project that meets the Clients exacting requirements. Through our understanding and continued research and innovation we meet and often exceed the strict quality standards and specifications demanded by our Clients. Getting the job done right, requires the right experience and knowledge for the work at hand. Our trusted performance and reliability in workmanship to complete a variety of projects requires the right balance of resources in people, equipment, materials, and finance which reduces the risk to our clients. They are assured of being partnered with an organization with a proven track record of completing projects on time and on budget. Our ability to provide multi-disciplinary services sets us apart, we are built to meet the needs of our Clients. 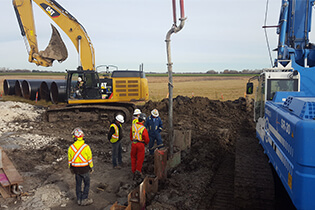 Investing in the right equipment, maintaining it properly and delivering excellence in workmanship with our long tenured and highly skilled work force, we routinely deliver small to very large complex projects.